We all get them or know someone who has: unsolicited phone calls, online ads, even knocks on our doors from solar salespeople offering “free home solar panels” that can eliminate our electricity bills and save us money. Sounds great, right? Unfortunately, these hard-sell tactics are creating confusion and misleading homeowners about the true costs and benefits of going solar. If you’re a homeowner considering solar, you’re not alone. Residential solar is experiencing extraordinary growth, a trend that’s expected to continue. In fact, the industry recently celebrated a critical milestone by reaching 1 million solar power installations in the U.S. It took 40 years to reach this mark, but thanks to falling prices and financial incentives, experts say it will only take two more years to hit 2 million installations. Yet, despite all of this momentum, many homeowners still struggle to distinguish a good deal from just a good sales pitch. And as with other big-ticket purchases, an uninformed buyer is at greater risk to pay more for less. In fact, homeowners can overpay by $10,000 for a standard solar energy system. Many of the industry’s largest solar companies and lead generation services know this, and actively try to exploit unaware homeowners by relying on false advertising and deceptive sales tactics to fuel their growth. 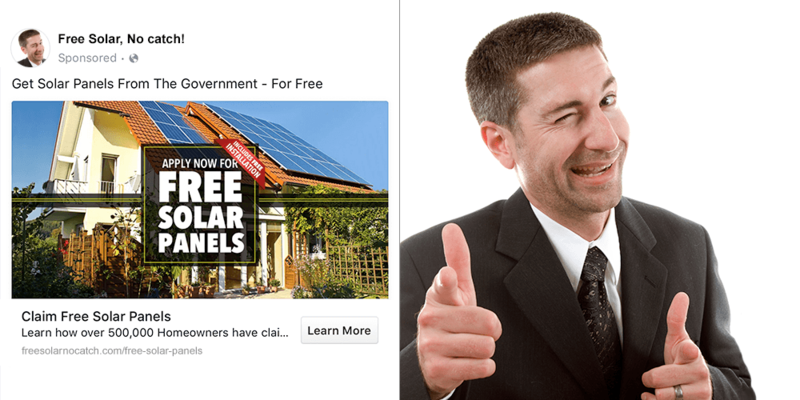 One look at today’s online solar ads and red flags should immediately go up. Many of these ads come from online “lead generation” websites, rather than the solar installers themselves. These websites make money each time they sell your personal information to a solar installer and will actively promote inaccurate information that borders on breaking the FTC’s truth-in-advertising laws. For example, consider the popular “free solar panels from the government” pitch. The reality is there’s no government program that will give you free solar panels, and ads that say otherwise are simply distorting the truth to mislead homeowners. Sales tactics like these aren’t new, nor is it unique to the solar industry. But when you consider how new solar technology is, and how little the average homeowner understands about the buying process, ads like this become all the more predatory and harmful. My advice? If the ad sounds too good to be true, it probably is. 1. Is a solar lease really the best way to go solar? More often than not, the answer is no, but since leases are the most profitable solar financing option for big solar installers to sell, it’s what they’ll push hardest onto homeowners. In fact, it’s how many of the top solar installers in the U.S. (particularly SolarCity) got so big. However, consumers are realizing that system ownership provides much more value, which leads me to the next question. 2. Why does buying my solar panels seem so expensive? To help persuade homeowners into signing their lease, some solar companies will drastically inflate the costs of buying solar panels from them – usually by thousands of dollars – which can make the lease look like the better deal. Yet with the increasing availability of $0-down solar loans, consumers that lack the cash for an upfront purchase are increasingly selecting system ownership – and rightfully so. 3. If I like what I hear, should I sign same-day? A face-to-face sales pitch is an opportunity for sales teams to walk away with your signature. They don’t want homeowners comparing offers from multiple installers because there’s a good chance they’ll lose your business. If you’re inclined to sign that day, keep in mind that you’re very likely find a better deal by shopping around – even if they offer you a cash rebate to sign up on the spot. As with any large household purchase, homeowners should arm themselves with as much unbiased information as possible before selecting a contractor. Checking company reviews on sites like the Better Business Bureau, or comparing multiple quotes on sites like EnergySage, can help ensure that homeowners make a well-informed solar purchase. With the support of the U.S. Department of Energy, we built EnergySage for the sole purpose of helping homeowners better understand and comparison-shop for solar. By taking these steps, homeowners will be better suited to spot a questionable sales pitch and feel more confident in their final decision – good news for consumers and for the solar industry. Vikram Aggarwal is the CEO of EnergySage, the country’s largest online marketplace for solar. EnergySage allows consumers to easily request and compare competing installation quotes online. Vikram founded EnergySage after more than 15 years of with Fidelity Investments. He holds an MBA from the D’Amore-McKim School of Business at Northeastern University, and is a CFA Charterholder.